David Rodan was born in Fiji and left with his family to come to Australia when he was just three years old. He has become one of a small band of Fijian descent players in the AFL, a list which includes Alipate Carlile (Formerly with Port Adelaide), Nic Naitanui (WestCoast Eagles), Aaron Hall and Tom Nicholls (both Gold Coast Suns). But Rodan is arguably the most successful Fijian player to date. A look at his record at AFL level bears this out. He played 185 games in his career over three clubs – starting with Richmond, then Port Adelaide and finishing with Melbourne. Over this time he amassed an impressive array of achievements including back to back Morrish Medals in the TAC Cup with the Calder Cannons (2000/2001), a grand final player with Port Adelaide in 2007, twice representing Australia in International Rules teams in 2008. He kicked 131 goals across his AFL career and polled 15 Brownlow votes, six of those in the 2007 season. In 2010 he also received the Peter Badcoe VC Medal as the best Port Adelaide player in their ANZAC Day match against St Kilda. Rodan rode the highs but also the lows of AFL football. Twice delisted by AFL clubs, Rodan also missed many games as a result of four serious knee injuries across his career, one which ended his playing days as an AFL player in 2013. Since then, Rodan has helped with junior development in Victoria, playing a role in coaching and developing the All Nations U15 team at National Diversity Championships in recent years. But his latest move could be the most inspirational of all. In a position to retire and leave the game having achieved so much, Rodan is instead donning the green tops of goal umpires to answer the call – still on the field but the other side of the boundary line. Last season, Rodan umpired some games in the VFL and was also recently in Darwin to umpire the Darwin Buffaloes versus Tiwi Bombers Round 13 match. 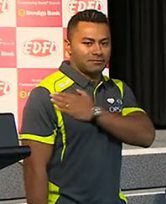 In an interview for the AFLNT before the match, Rodan stated that he hoped that by becoming an umpire himself it may encourage more indigenous and multicultural players or followers of the game to follow his lead. As an AFL Multicultural Ambassador, Rodan has certainly ensured that everything he gained as a footballer is being given back to all levels of the game – junior and senior as well as on and off the field. The game will be richer for his contributions. Rodan’s next challenge will be part of the AFL umpiring team for this season’s JLT Community Series – the AFL’s pre-season competition. At last year’s E J Whitten Legends Game he famously performed the “worm dance” after a goal was kicked. Now he will be more renowned for his accuracy behind the goals as he strives to be a full time AFL goal umpire this season. Not at all bad for a young kid from Fiji. Great work, David Rodan – a true Multicultural Ambassador for Australian Rules football at so many levels.